"Pension funds and major asset managers are realizing we can actually make active bets over there [in the credit derivatives market] without these scary derivative things blowing up in our face," says Tim Backshall. The explosive popularity of credit derivatives has inspired countless experts to offer their advice on what to trade. Fewer, no doubt, have taken that concept to the level that Tim Backshall has. "The timing was right for an independent credit derivatives research product," he says, and that's exactly what he's sought to provide at the aptly-named Credit Derivatives Research since CDR CEO Arthur Rosenzweig – impressed by his writing in Credit Magazine – lured him from Credit Market Analysis. In October, the firm, which is affiliated with corporate bond research firm Gimme Credit, launched Trading Ideas, providing detailed trading tips for credit derivatives traders. As of the beginning of this week, there were 52 trading ideas, providing a very healthy return. Backshall, as chief credit derivative strategist, is their author, most recently recommending a "curve steepener" on bad news bear RadioShack Corp. Don't know what a curve steepener is? No problem: Trading Ideas provides detailed explanations of various trades in the market, and how to pull them off. Backshall, 36, who hails from the south of London, says he's "been working in and around the credit derivatives market since it started," first with Bankers Trust and Deutsche Bank, with tours of duty in London, New York and Tokyo, before joining MSCI-Barra, where he created that firm's credit offerings. Now, he brings his decade-plus experience in modeling and risk management to CDR at its Walnut Creek, Calif. Office. (The firm also has a New York office.) "I wanted to get my tan while I'm still young," Backshall jokes. InstitutionalInvestor.com's Jonathan Shazar spoke with Backshall about growth and innovation in the credit derivatives market, some fat returns and his advice's place. This is an excerpt of their conversation. InstitutionalInvestor.com: Why is [it the right time for this product]? Tim Backshall: We're just about positioned for the next leap forward in credit derivatives trading. As more and more liquidity is pushed into these markets, more and more of the traditional buy-side managers – the guys managing the billions in fixed-income assets – are starting to realize there's real liquidity, real transparency and real opportunity in the CDS market for them to trade. They are learning about these approaches and seeing that it's possible to get them into their mandates without completely ruining the approach they have to tracking their index. II.com: So we'll see more pension funds and the like in credit derivatives in the years to come? TB: Yea, I believe it will happen in two ways: The continuing trend of investing in alternative investments, [and] the channeling of capital into hedge funds that are specifically credit-oriented. In the most vanilla sense, pension funds and major asset managers are realizing we can actually make active bets over there [in the credit derivatives market] without these scary derivative things blowing up in our face. II.com: What does this new product offer the market? TB: One of the most important parts of what Trading Ideas does is offers the active trader something to think about – a specific name on a day when maybe there isn't much news going on. We also go into great detail on the risks – how the technical side of the trade ties in with the fundamental side – and try to build confidence around that trade, rather than just throwing trade ideas around for the sake [generating] flow. The main idea here is for us to actually try to generate performance. And for a manager or trader that isn't active in CDS yet, [but] who wants to dip his toe in the ocean, certainly the amount of detail in both the trading ideas and the trading techniques will hopefully give them confidence. II.com: How have the 50 or so trades done so far? TB: Performance is pretty good: We're up over 1,600 basis points in that period [since October]. [1,701.35 bps, to be exact, as of Tues., Feb. 28.]. TB: We're pretty pleased with that. II.com: What are you looking for in a trading idea? TB: The critical part of what we do is balance a quantitative approach, in which we use a number of different models that I've used and helped to build over the years, and combine that with a very fundamental perspective on these credits. We use [the fundamental research of] one of our affiliates', Gimme Credit, to back up any quantitative ideas or value ideas that we have within our framework. We're generally looking for outliers, not just for a fundamental breakdown in the credit and trying to ride that wave. We're looking for small arbitrages as well as, for opportunities where the market seems out of line. II.com: For the Trading Ideas, how important is liquidity? TB: We discuss liquidity in a lot of detail. It's all well and good just to keep telling people to put trades on, but if they can't actually trade them or make money from them, then nobody's going to pay us for that service. We do a lot of work to track how liquid a market is, the bid-offer as well as how many bids and offers we see every day. We track in our markets indicators page two indices that are of particular interest. One is called market depth, and that is the tracker index of the names that we feel are actively tradable. That has moved up from just about 800 names at the beginning of 2005 to well over 1,000 names now. We also track market activity, which is a way of indexing how much liquidity there is in the marketplace. There is a song called "I Don't Like Mondays" by the Boomtown Rats – a great song – but we did some analysis and found there was microstructure in the CDS market. During the week, we see this cycle of liquidity that peaks on Tuesday, so on Monday and Thursdays and Fridays, generally liquidity is significantly lower than the middle of the week. We used that to influence when we put on trades that we feel are less liquid. Instead of "I Don't Like Mondays," we like Tuesdays. Tuesday is a great day for liquidity in the CDS market. Europe still leads the U.S. in terms of liquidity, about 10-15% higher in liquidity that the U.S. Asia is about 30% as liquid, but they certainly are bouncing up the most, they're up about 50% in terms of liquidity over the last year. II.com: Is the U.S. catching up? TB: Absolutely. Over the last 18 months to two years, the U.S. is leaps and bounds jumping up there at the level of Europe. II.com: What are the important things that have changed? TB: A lot of it comes down to the creation of the indices, a sort of active flow in large names, and a level of comfort for investors that there will be a market there when potentially there might be some big events happening. That has a virtuous circle effect on the underlying names. Events like last year, with Calpine and Delphi, where a default happened and the market didn't fall apart. Operationally, things seem to be getting better. I still think back to [Alan] Greenspan and Warren Buffett [when] discussing this a couple of years ago, Buffet said [credit derivatives] are financial weapons of mass destruction. Greenspan had a slightly smarter way of looking at it, in that they spread risk around. 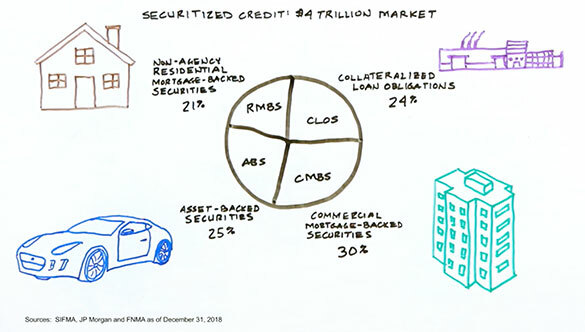 It's just the education of, and the recognition by the marketplace that these credit derivative things actually help us move money around the markets to spread risk around and manage risk more effectively. II.com: What's next for the credit derivative market? TB: I certainly don't see the growth slowing down. We're starting to see more and more trading across the curve, across the turn structure for individual names. Most names are very active in their five-year; we've recently seen a lot more liquidity in the seven- and the 10-years. Realistically, there's plenty of scope for more liquidity within all the names. It's that extension across the curve that's going to be a big change in the next couple of years, and we've already seen that change happening. The complexity of the trade types will continue to grow. As we've moved from simple vanilla CDS to constant maturity CDS to tranches and options and all these wonderful things – many of which I'm sure will remain quite liquid – the dealers will do their best to come up with new ideas to eke out a little more margin from their clients. Right now, we see the development of quite an active market in index options. I think the next big thing that most people want to see, certainly the buy-side asset managers, is a market developing in single-name options; right now, that market is quite small and quite illiquid. The development of a single name CDS option market would be very good in terms of providing another way to make those bets and another, more leveraged way to understand just where risk is going. II.com: Thanks for your time.